1. Any player on a regular season team may pitch. (NOTE: There is no limit to the number of pitchers a team may use in a game). 2. A pitcher once removed from the mound cannot return as a pitcher. d. Note 1: A pitcher who delivers 41 or more pitches in a game cannot play the position of catcher for the remainder of that day. Exception: 12/13 - A pitcher who delivers 51 or more pitches in a game cannot play the position of catcher for the remainder of that day. b. If a player pitches 1-30 pitches in a day, no (0) calendar day of rest is required. 7. Each league must designate the scorekeeper or another game official as the official pitch count recorder. 8. 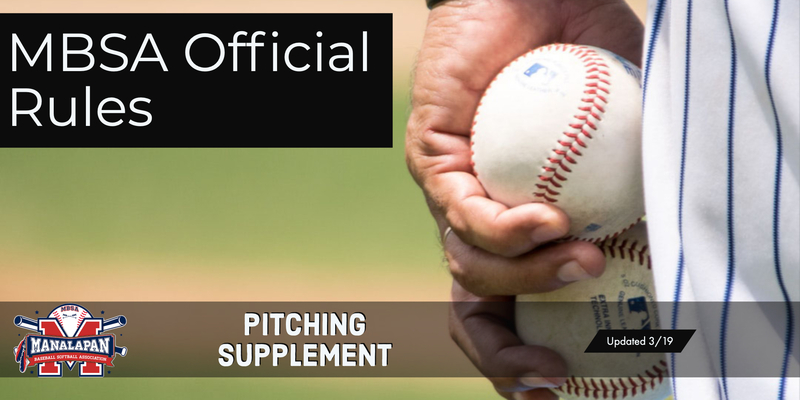 The official pitch count recorder should inform the umpire-in-chief when a pitcher has delivered his/her maximum limit of pitches or innings for the game or week, as noted in Regulation 3a & b . The umpire-in-chief will inform the pitcher’s manager that the pitcher must be removed in accordance with Regulation 3a & b. However, the failure by the pitch count recorder to notify the umpire-in-chief, and/or the failure of the umpirein-chief to notify the manager, does not relieve the manager of his/her responsibility to remove a pitcher when that pitcher is no longer eligible. 9. Violation of any section of this regulation can result in protest of the game in which it occurs along with a 1game suspension of the team manager. Protest shall be made in accordance with individual division rules. 10. A player may not pitch in more than one game in a day. (Exception: In the Big League Division, a player may be used as a pitcher in up to two games in a day but still must follow the rules as noted in regulation 3a & b. Example - A player plays the position of Catcher for the first 2 innings of the game and then goes in to pitch. If his maximum allowable pitch count was previously 85 pitches, he now begins with a max PC of 45 pitches (85(2x20)). 60/90 Fields - Catcher limitations at this level are at the manager’s discretion. a. The withdrawal of an ineligible pitcher after that pitcher is announced, or after a warm-up pitch is delivered, but before that player has pitched a ball to a batter, shall be considered a violation. Little League officials are urged to take precautions to prevent protests. When a protest situation is imminent, the potential offender should be notified immediately. b. Pitches delivered in games declared “Regulation Tie Games” or “Suspended Games” shall be charged against pitcher’s eligibility. c. In suspended games resumed on another day, the pitchers of record at the time the game was halted may continue to pitch to the extent of their eligibility for that day, provided said pitcher has observed the required days of rest.